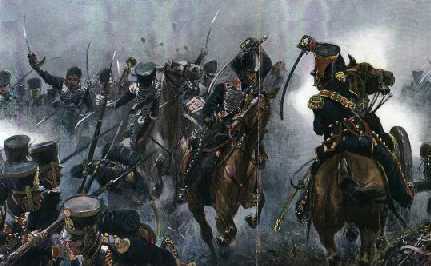 Brandenburg Hussars charging at the Battle of Leipzig, 16 October 1813. Original painting by Prof Carl Röchling. Reproduced in Die Deutschen Befreiungskriege 1806-1815 by Prof Müller-Bohn, Published in 1900(?). 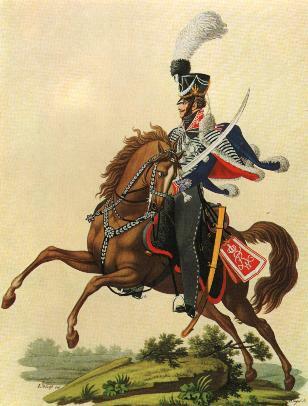 Prussian Hussars were famous for their bravery. At the Battle of Heilsberg in 1807, the Prittwitz Hussars charged and captured the Eagle of the French 55th line infantry regiment. At the Battle of Leipzig in 1813, the Mecklenberg-Strelitz Hussars charged and captured the Eagle of the Marines of the Imperial Guard. We should also recall that the fiery Prussian Marshal Blücher - Marshal Vorwärts himself - started his career in the Prussian army as an hussar officer. 1806 - 10 Hussar Regiments each of 10 squadrons. Total of around 150 officers and men per squadron. 1813 - 1814 - 6 Hussar Regiments each of 4 squadrons. Total of around 150 officers and men per squadron. 1815 - 7 Hussar Regiments each of 4 squadrons. Note: The shako was introduced in 1804. By 1806, not all regiments had converted to the new headgear. Hence, some regiments wore mirletons while others wore shakos. White plumes for men / white with black base for officers. Regt no 5 wore a death's head badge on the front of their shakos. Headgear was the shako. This was covered by an oilskin on campaign. Under the oilskin, the shako had a central black and white rosette (black and silver for officers). The 2 Life regiments had a white metal death's head badge. The Guard Hussars had a brass "guard" star badge (silver for officers). Just below the plume, a black and white cockade was worn. Troopers wore a long white plume on parade. Officers wore a long white plume with black base. Pelisse fur was white for troopers and grey for officers. From 1815, black pelisse fur was also worn by both officers and troopers of the 2nd, 7th, 8th, 9th, 10th and 12th regiments. Sash was in the facing colour with barrels in the button colour. Officers' sashes were silver and black. 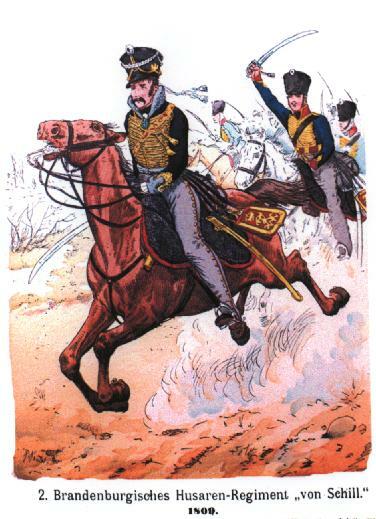 The famous Major von Schill at the head of the 2nd Brandenburg Hussars in 1809. The regiment was disbanded in 1809, after Schill's unsuccessful attempt to start an uprising in Northern Germany. This regiment wore the same uniform as the 1st Brandenburg Hussars except that shoulder straps were yellow.